Is Your IoT Data Ready for Action? You can't ignore the possibilities that come with making IoT data actionable. While some organizations get the value of big data, many others are still trying to understand the implications materializing in a new wave of information collection, analysis, and action. The Internet of Things (IoT) will stoke the counters with big numbers in short periods of time, and IT and executive management needs a deeper understanding of what customers want and businesses demand. The slide below, from 451 Research, speaks mountains about the volume of data collected. As I believe you'll agree, we can't ignore the possibilities of making this sort of data actionable. According to 451's research, the top five goals of enterprises adopting IoT projects are increased revenue, improved service or product quality, lower costs, reduced time to market, and reduced risk. With the understanding of what the business wants, you can begin to drill down to details about each goal. Getting to actionable data requires running analytics on data sets, and correlating across data sets. AppDynamics (now a Cisco company), describes this as "smart data." Using its App iQ platform, you could correlate end-user business transaction details with completion status, response times, and all other data points measured at any given time, as the company describes on its website. With that analysis, you could then " draw conclusions and take the appropriate action." 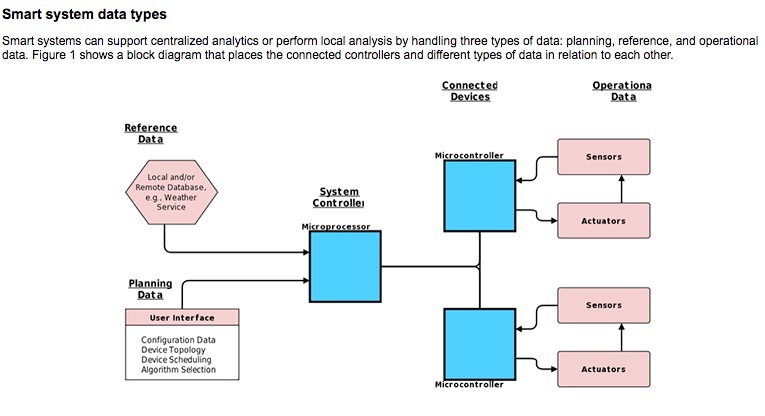 Three types of data -- planning, reference, and operational -- come into play with a smart system, suggested Digi-Key editors in the article, "Data Logging for IoT: Analyzing the Environment for More Stable and Efficient Systems." They use the example of a smart irrigation system to show the types of questions and design issues facing most IoT systems. Most importantly, as Digi-Key concludes, you must remember that not all data is necessarily good data. Getting the right data is critical to improving the efficiency of a system.